I was chosen to participate in a month long program for weight loss. I took VivSlim Premium, a weight loss and cleanse capsule with a proprietary blend of herbs in it. The company claims you can lose up to 25 lbs. in 4 weeks on this product. by decreasing appetite, increasing metabolism and energy and acting as a cleanse for the body's system. The new premium formula contains all of the ingredients of the original VivSlim, but in higher concentrations and combined with two additional all natural ingredients: tarragon leaf and psyllium husk. - Tarragon Leaf: Well known for its powerful effectiveness in treating digestive problems, tarragon leaf helps the body get rid of impurities and toxicities that can increase the chances of obesity. - Psyllium Husk: With 80% of its contents being fiber, psyllium husk has been used for centuries in Asia for its powerful effect on the metabolism of glucose and lipids. This all-natural plant works to keep the digestive system healthy while giving you the feeling of satiety and reducing the feeling of hunger. - Medical Amylum: A variety of starch that promotes satiety and controls the body's fat intake by blocking the non-fat material converting into fat. - Jobsteers Seed: The extract from jobsteers seeds decompose body fat, eject heat, and help the bowels remove waste properly. - Bitter Orange Fruit: Used for centuries in traditional Chinese medicine to relieve stomach upset, suppress appetite, and assist with mild insomnia. - Lotus Leaf: Known as "the slimming natural medicine," and the "Sacred Lotus," lotus leaf lowers the body's cholesterol levels and aids in digestion. - Mulberry Leaf: Used in Chinese medicine for maintaining normal blood sugar and blood fat level, urine fluid level, and facilitating bowel movement. - Konjac Root: The soluble fibers of the Konjac Root aid in suppressing hunger while working to lower blood cholesterol, slow glucose absorption, lower the glycemic index, and promote regular bowel movements. - Cassia Seed: Sweet, bitter and salty in flavor, cassia seeds are associated with the liver, kidney, and large intestine and work to relax the bowels. VivSlim Premium's unique blend of natural extracts provides a completely smooth weight loss process that is supposed to help you control your hunger impulses safely and effectively. But does it really work? How well does it work? Read on to find out. Directions: Take one capsule in the morning with a glass of water before or after breakfast. There are no diet or exercise requirements to participate. VivSlim Premium is supposed to work by reducing appetite and increasing fat absorption without the unwanted side effects of commercial diet pills such as upset stomach, diarrhea, headaches, facial flushing, congestion, or dizziness. VivSlim's all natural ingredients have a cleansing effect on your system, flushing out toxins and impurities that can lead to weight gain, fatigue, and premature aging. PremierSlim's approach to health and well being extends beyond their product line and into their entire business process. Because their products are lifestyle products that integrate into their customer's daily routines, they want the experience to be positive and fruitful at all levels. They price their products at affordable rates for consumers, while offering a healthy margin for their resale partners. The weight loss and cleansing blends are backed by science to ensure results and their ingredients are sourced from high quality natural sources to ensure that people feel great both about integrating VivSlim into their lives day after day, month after month. I hate to say this, but I only lost 3 lbs. with this product. I was expecting to lose a lot more, hoping to lose a lot more. It honestly did not help decrease my appetite any and did not really help "cleanse" my body of any toxins, as I was expecting. I must say that I am very disappointed with the results I achieved with this product, I was hoping to lose at least 10 lbs. or more. 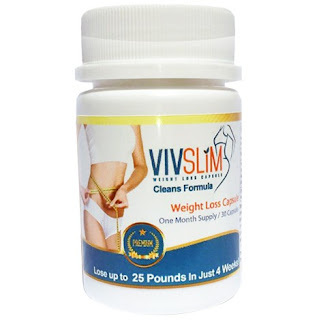 VivSlim makes it sound as if you are going to lose a magical 25 lbs. at least. Now, I understand that those results are not for everyone. But I do expect that I would have lost a few more pounds at least. I followed the directions, took the capsule with water on an empty stomach every morning. I really would have thought I would have lost more. So, in conclusion, I am not very happy with my results of the product. I am not sure if it was something I did wrong. Maybe it is because I am taking some medications that are interfering with the product's ability to work. That could be something,. I take a few medications and I know the pain medicine interferes with my digestive system. It could be something that simple. A lot of medications interfere with diet and weight loss products. That is not to say that this will not work for you. It could. Every person is different. If you go to their website, www.premierslim.com, you will see testimonials by people for whom this product has worked. So, this could just be the case for me and me only. Other people have had better success with this product.